"Although we don´t know if the happiness can be bottled, we try in each one." It´s born following one dream of a group of friends , they have put their life ambitions into giving a life to this wine, enjoying the process of elaboration and wake up a new sensations in wine tasting for the lovers of wine. Bodegas TERMINUS is located in Villabuena de Alava, in Rioja Alavesa, under the rift of Sierra Cantabria. This drives us to meticulously look after the vineyard and make a limited production of bottles because the time and attention in the elaboration of our wines, doesn´t allow us make more quantity. We don´t know if the happiness can be bottled, we try in each bottle. We hope to accompany you in your greatest moments. 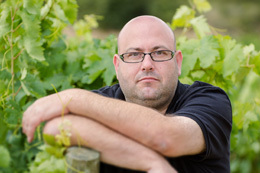 He is winemaker and one of the four founding partners who has a great passion for wine making and vineyards. 01307 Villabuena de Álava (Álava). Spain.